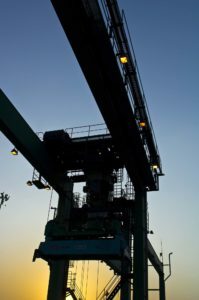 Kalmar, part of Cargotec Corporation, has signed a deal with Deepwater Container Terminal (DCT) Gdansk in Poland to supply a total of five electrically powered RTG cranes with extensive customisation. The order also includes the supply of a spare parts package for the machines. The delivery is scheduled for early 2019. DCT Gdansk is Poland’s largest and fastest growing container facility, and the only deep-water terminal in the Baltic Sea region with direct ocean vessel calls from the Far East. In October 2016, DCT Gdansk completed its large-scale project of construction of the second deep-water berth (T2), which doubled its annual handling capacity to 3 mln TEU. Today, the terminal boasts 1300m of quay with 16.5m depth and 11 STS Post-Panamax and Super-Post-Panamax cranes. On its vast area of 71 hectares, DCT Gdansk currently operates a total of 35 RTG cranes, of which two are Kalmar machines. The five Kalmar Zero Emission RTGs, each with a lifting capacity of 41 tons, will be used to expand the existing fleet. The fully electric power system produces no emissions or engine noise at source, and completely eliminates the need for hydraulic oil. The machines also require significantly less maintenance than diesel-powered RTGs. The RTGs will be powered by a cable-reel system and will include an advanced machine-vision-based anti-sway system with an extended camera system to assist the operator. They will also be fitted with a comprehensive range of Kalmar SmartPort automation features, including the Kalmar SmartRail automated gantry steering solution, Kalmar SmartFleet process automation solution and Kalmar SmartProfile spreader anti-collision system.